SciFiNow just realeased a list of ‘Top 10 Strong Femal Characters In Urban Fantasy’ and our very own Clary Fray made it into this Top 10 list! Shadowhunters, finally we have a first look at the 2014 Mortal Instruments: City of Bones 16-Month Wall Callendar from Trends International. The calendar features new promotional images from the film, and as well very good incorporated Runes. What you think Shadowhunters? I guess I’m going broke this summer! Great news Shadowhunters! 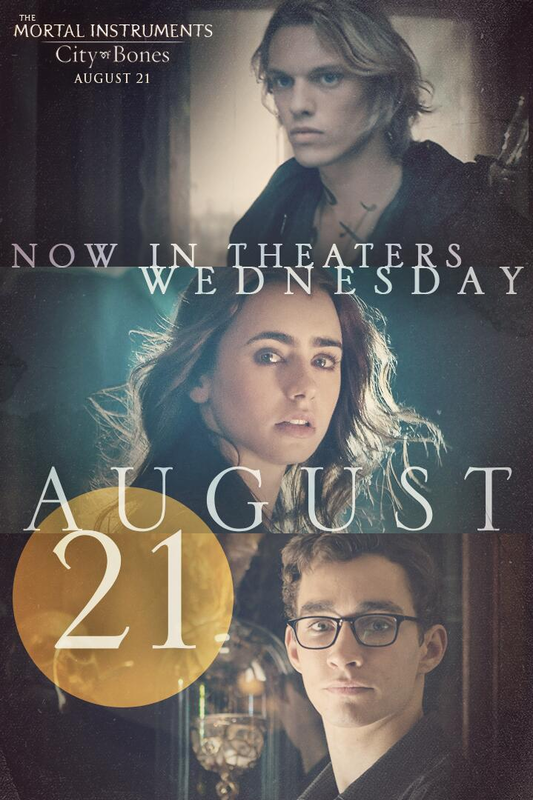 Sony Pictures has revealed that The Mortal Instruments: City of Bones will hit theaters 2 days early! Yes! City of Bones will be out in US Theaters on Agust 21, 2013. This is a very exciting news because we now get to see this amazing movie early! 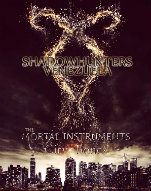 Shadowhunters, I cant really wait till August! Guess what Shadowhunters?? 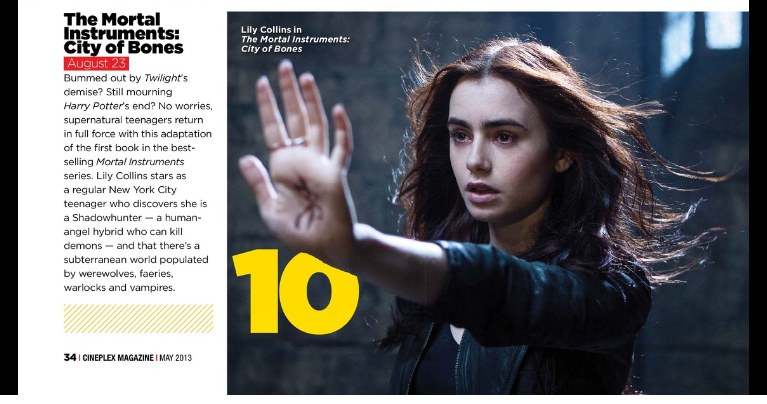 Cineplex Magazine named The Mortal Instruments: City of Bones to ‘Summer’s 10 Must-See Movies’ list. Cassandra Clare teased us with yet another City of Heavently Fire Snippet in her Tumblr account. The final installment of the international bestselling The Mortal Instruments, out in March of 2014. He has always had green eyes, said the voice in her head.People often marvel at how much alike you are, he and your mother and yourself. His name is Jonathan and he is your brother; he has always protected you. Shadowhunters, what you think? What are you theories? Shadowhunters, great news. 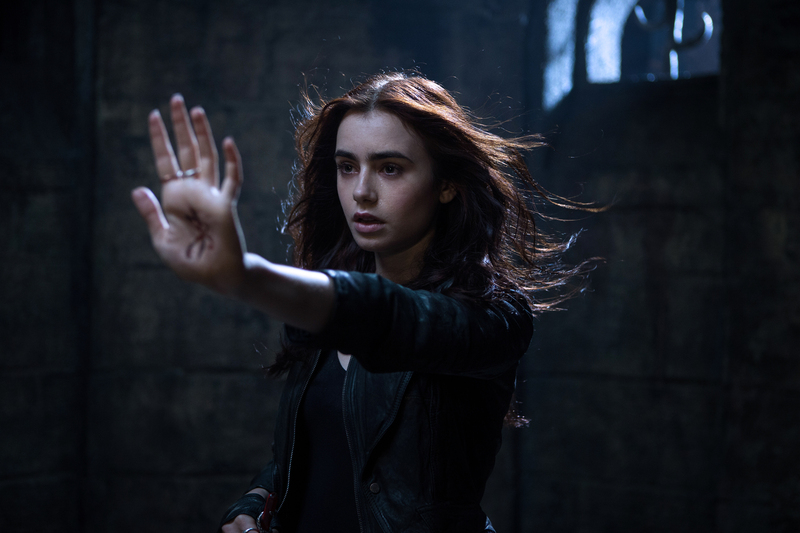 Some new exclusive footage from The Mortal Instruments: City of Bones will be shown at Leaky Con in Portland, Oregon on June 29. LeakyCon will also feature a conference chat with author Cassandra Clare following the screened footage. We have some very exciting news for LeakyCon Portland today! Sony Pictures will show us exciting new footage from the upcoming film, The Mortal Instruments: City of Bones at LeakyCon in Portland on June 29, 2013. This glimpse at the eagerly awaited film will be accompanied by a live video conference chat with the New York Times Bestselling author of the series, Cassandra Clare, a famous alum of the Harry Potter fan world. We are thrilled welcome her to LeakyCon, and can’t wait to bring this peek to our guests! LeakyCon will run from June 27-30 at the Oregon Convention Center in Portland. Registration for LeakyCon is only $160, for the 4-day Convention. You can also purchase a single day pass. Any of our readers attending this Convention? Sound off in the comments! Yes Shadowhunters, The Mortal Instruments: City of Bones was named to Seventeen’s list of 10 Must-See Summer Movies. 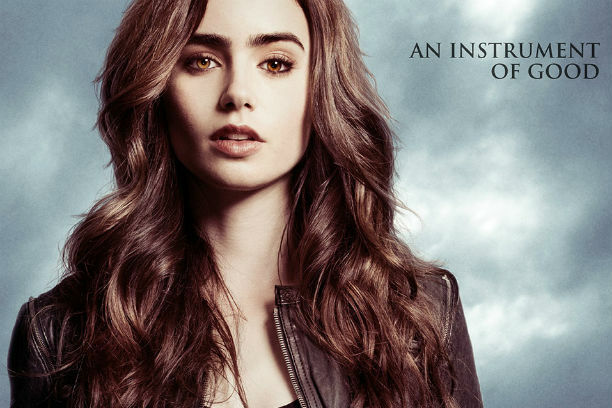 What It’s About: Based on the best-selling book, Lily Collins plays Clary, who discovers shocking details about her past when her mom is attacked by a demon. Her entire life changes when she tries to rescue her mom. Hot Guy Factor:Jamie Campbell Bower may have looked creepy in Twilight as Caius, but he’s smokin’ hot in this movie! Shadowhunters, mark your calendars because we are getting more Cassandra Clare’s Books! Yes, its true. 2014 will be the year of the release of The Magisterium Series. Magisterium, a five-book middle-grade series with “one book for each year of Call’s life between twelve and seventeen,” is co-written by Cassandra Clare and Holly Black. The Iron Trial, the first installment, will be published by Scholastic Books in 2014. 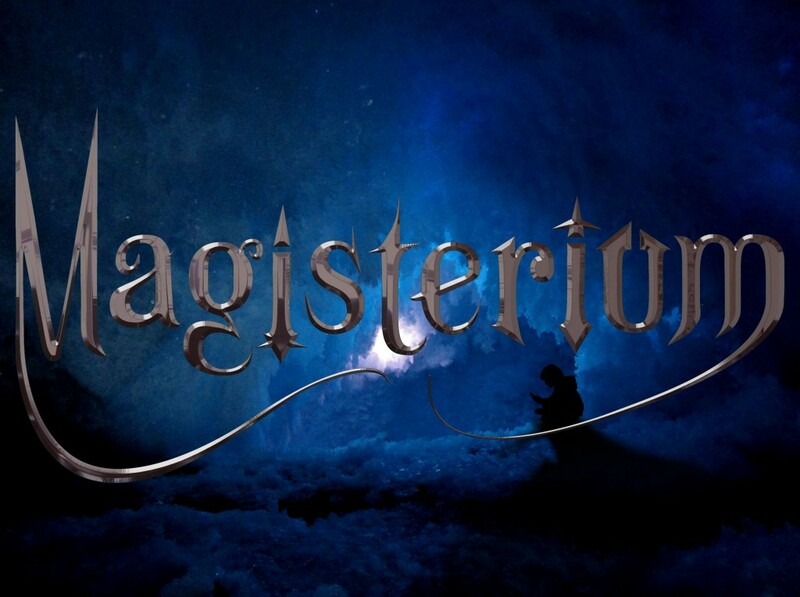 New teaser art for the Magisterium series can be found on miss Clare official Website. The Film Rights for The Iron Trial where quickly snatched by Constantin Film, the studio that owns the film rights to The Mortal Instruments and The Infernal Devices. Miss Clare and Miss Black will pen the screenplay and serve as executive producers. What you think? Are you excited for The Magisterium Series? Our very own Clary Fray, Miss Lily Collins recently spoke with The Hollywood Reporter to promote her upcoming film The English Teacher. Among the topics discussed was The Mortal Instruments: City of Bones, where miss Collins addressed the ups and downs throughout the process of finally bringing City of Bones to the big screen. THR: You’ve been attached to Mortal Instruments through a lot of ups and downs. Was that ever disheartening to you — and as an extension of that — how rewarding was it when you finally got to film it? LC: I’m a big believer that everything happens for a reason. I knew that by it going through this process, it was gonna come out at the end of it with the appropriate team, the right people involved. I had been a firm believer in the story. I was a fan before I was cast, so it’s something that I’ve been passionate about before really being involved in. I didn’t wanna pass up the opportunity to be able to play this heroine that I’ve admired and I just knew that I believed in the studio that has it, Constantin. I believe in the producers at Constantin and I know that they have a really good taste level when it comes to the creative side. I knew that they wouldn’t put it somewhere where it didn’t belong, so I just didn’t know with timing. I just prayed that it wouldn’t come to the time when they were ready to shoot and I was doing something else ‘cause I thought, “I can’t have it get to this point and then not be able to do it.” I was very fortunate of the timing of everything. I couldn’t be prouder of the project. I’m so excited for people to see it. I really think Harald [Zwart] did an amazing job of taking what could’ve been a CGI-heavy, action-packed reliant film and really made it about heart and character and emotion. Special effects are just the icing on top. I think, as well as hopefully pleasing the fans of the series, we’re going to invite new people in and make them obsessed with the story as well. LC: Yes. I mean, it just depends on — you kind of have to see how the first one goes. As with any potential franchise, you just leave it up to kind of the fans and to see what happens with the first one and you hope. I signed on because I love Clary and I would want to play her for as long as I can. At the end of the day, you have to kind of step back and remove yourself and go, “OK, we’ll we just have to see what happens” and you go along with the flow. I think all of us would really love to play characters for as long as the fans will have it. Shadowhunters, while we wait for The Mortal Instruments: City of Bones release in August, there’s a ton of merchandise coming up in the following months. So I guess we can treat ourselves a little bit while we wait. Our gals from Trends International released the first look of 3 amazing posters coming up at a US/Canada retailer near you. The three posters in the pre-pack include two with the principal cast of characters and the other poster features the City of Bones book cover. The poster on the left features (from left to right), Simon (Robert Sheehan), Clary (Lily Collins) and Jace (Jamie Campbell Bower) in front of what looks to be the portal seen in the trailers. Underneath the title of the film is displayed. The poster on the right features our principal characters (from left to right)–Isabelle (Jemima West), Simon (Robert Sheehan), Clary (Lily Collins), Jace (Jamie Campbell Bower) and Alec (Kevin Zegers)–with an Angelic Power rune behind them. The tagline “A World Hidden Within Our Own” appears above them. No official word yet on when we will get hold of this posters, or how much they will go for. But usally we get to see this type of posters in stores such as K-Mart, Walmart and Target. They usually go from $4-7. We will keep you updated as soon as more information is out in the internet. For breaking news from THE MORTAL MINUTE subscribe for updates and Pink Unicorns will be sent straight to your email.